Even though the D.C. region dodged the worst of this weekend's coastal storm, a wave of freezing air is creeping in from southeastern Canada. The D.C. Department of Human Services announced late Sunday afternoon that the city has activated its cold emergency plan. Here's what you need to know. WASHINGTON — If you’re hoping for a view of the lunar eclipse tonight, bundle up. Temperatures are about to plummet into the teens, with forecasters warning of gusty winds and hazardous wind chills to start out the week. A Wind Chill Advisory will be in effect for the entire WTOP listening area from 10 p.m. Sunday to 11 a.m. Monday. The National Weather Service said wind chills of negative 5 to negative 15 degrees were possible, resulting in hypothermia and frostbite if precautions are not taken. NBC Washington meteorologist Lauryn Ricketts tweeted a warning about the dangerously cold temperatures anticipated Sunday evening, advising those with pets to bring them inside for the night. She also recommends that anyone planning to attend MLK Day events around the Tidal Basin on Monday should layer up. D.C. Department of Human Services tweeted late Sunday afternoon that the city had activated its cold emergency plan. This means additional services and support will be available for those without a place to spend the night. Human Services asked residents to call the shelter hotline at 202-399-7093 if they see anyone experiencing homelessness, as temperatures will be dangerously cold overnight. ❄The Cold Weather Emergency Alert is currently ACTIVATED. The Shelter Hotline at (202) 399-7093 or dial 311. For parts further out of the WTOP listening area, a wind chill warning is in effect from 4 p.m. to 1 p.m. Monday. This is for parts of western Maryland and western Virginia, where wind chills are forecast to be as low as 25 below zero, according to the National Weather Service. Even though the D.C. region dodged the worst of this weekend’s coastal storm, a wave of freezing air is creeping up in its wake from southeastern Canada. Winds picked up around noon on Sunday and drove temperatures downward. It’ll become bitterly and dangerously cold, with single digit wind chills in the area. Watch for icy roads during the Monday morning commute. Sunday night’s primary concern was strong wind gusts that moved in along with the colder temperatures. The good news is the strong winds are helping dry out surfaces that are merely damp. Standing water will freeze today. Lots of salt/treatment washed away in the rain. The Maryland Transportation Authority (MDTA) issued a number of warnings for drivers about the high winds that are expected into the evening. The agency said any vehicle that law enforcement feels will not be able to cross several area bridges — including the Bay, Key, Hatem and Nice-Middleton — safely will be stopped while the high winds continue. The Virginia Department of Transportation issued an advisory for drivers in northern Virginia. The advisory asked drivers to to be aware of potential icy spots on the road, especially overnight, and to check road conditions before venturing out. 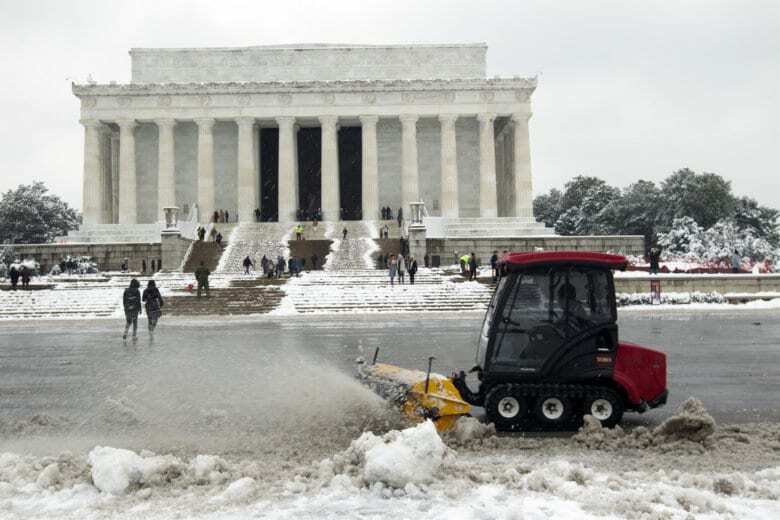 This weekend’s storm proved a travel headache for millions, from the Midwest to the Northeast. Snow and wind caused the cancellation of more than 650 flights at Chicago’s O’Hare International Airport on Saturday and resulted in an average delay of 50 minutes, the airport said. At John F. Kennedy International Airport, crews were working to keep runways clear Saturday night, the airport said, as it encouraged travelers to confirm upcoming flights with airlines. A hard freeze should set in Sunday evening, according to Storm Team4 meteorologist Matt Ritter. “Temperatures will fall below freezing Sunday afternoon, leading to icy spots on our roadways,” NBC Washington meteorologist Mike Stinneford said. Monday is expected to be “blustery and very cold,” said Ritter. Highs will be in the 20s for Monday, with wind chills below zero for much of the day. The map below contains power outages in the District of Columbia. This map is updated every 10 minutes. The Associated Press and CNN contributed to this report.